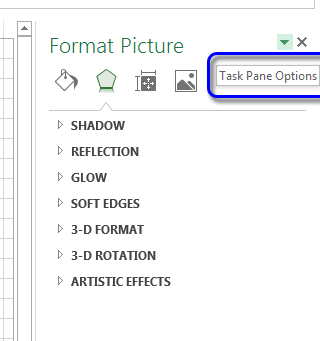 Task pane is another useful user interface in Excel. Some commands in Excel will respond automatically with task panes. 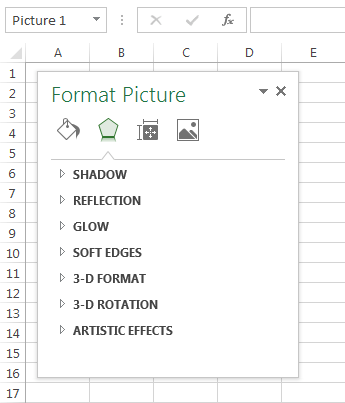 For example, if you work with a picture, and right click the image and choose Format Picture, Excel will display the Format Picture task pane. The task pane is similar to a dialog box except that you can keep a task pane visible as long as you want. Using some task panes is not so easy. 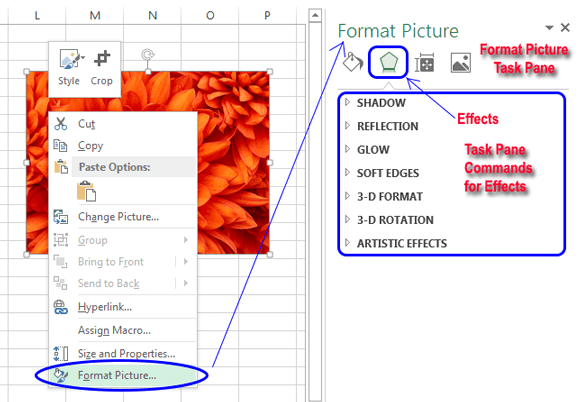 The Format Picture task pane has four icons- Fill & Line, Effects, Size & Properties, and Picture. The names are shown when you hover your mouse pointer over the icons. For example, click an icon and you will find a command list below the icon tab. Click a command from the list and you will be shown some options in drop-down style for that command. There’s no OK button in a task pane. If your job is done with a task pane, click the Close button (X) in the upper-right corner. Using task pane through the keyboard is simple. Just make sure that the task pane is displayed in your workbook and press F6 to activate the task pane. Then use the tab key, the arrow keys, the spacebar, and other keys to navigate within the task pane. 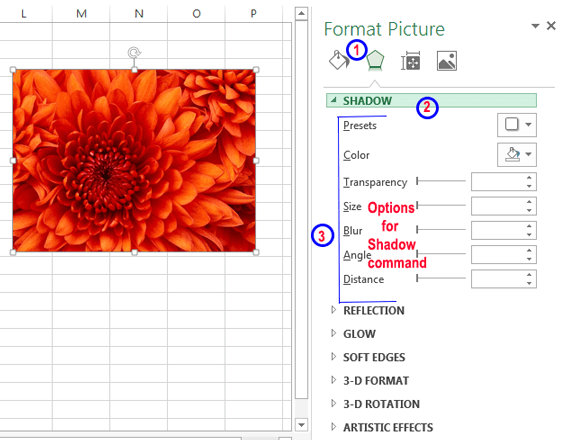 By default, the task pane is placed on the right side of the Excel window. If you want, you can move it anywhere you like, by clicking its title bar and dragging. You can also use the ‘Task Pane Options’, an icon beside the ‘Close’ button. There are three options here-Move, Size, and Close. Excel will remember the last position of your task pane, so when you will use the task pane next time, it will be right there where you left it. Task pane moved to another place. Tips: You can’t navigate within a task pane through keyboard using Tab, Spacebar, the Arrow keys, and ALT keys like you use to navigate within a dialog box. First of all, you have to activate the task pane pressing F6 key. Then use Tab, Spacebar, the Arrow keys, and Enter from your keyboard to navigate within a task pane.